Low platelet count, or thrombocytopenia, is a serious disease requiring veterinary attention. Dogs suffering from thrombocytopenia often require hospitalization and emergency blood transfusions. After the initial life-threatening period has passed, your vet might recommend additional treatment, such as antibiotics, to treat any underlying infections or problems. Thrombocytopenia is a serious condition that requires urgent vet care. Platelets are cell fragments that help prevent blood loss when a blood vessel is fractured or an injury occurs. When the platelet count is low, there's a risk that the animal might bleed out from even a small injury. Thrombocytopenia can be congenital, but most cases are acquired. This means they happen after severe blood loss, bone marrow problems or administration of certain drugs, including aspirin, acetaminophen and penicillin. A dog with a low platelet count doesn't always show symptoms. Sometimes only a blood test will show that something is wrong. Some dogs experience gum bleeding, or they might bleed after an injection. Some dogs also bruise easily, develop nosebleeds or a red rash caused by capillaries breaking and leaking under the skin. Without a transfusion, a dog will get weaker and weaker and could die. 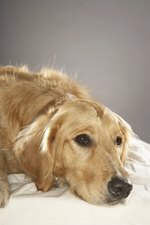 Always seek prompt veterinary care if your dog is showing any of these symptoms. Treatment depends on the condition of the dog and the underlying cause, but many dogs need a transfusion. In addition, dogs with a weak immune system might need immunosuppressive drugs, such as corticosteroids. They might need antibiotics or other drugs to treat conditions associated with the low platelet count. Serious cases might require hospitalization until the dog is strong enough to go home. Conditions that can lead to a low platelet count include cancer, pancreatitis and impaired bone marrow production. Cases of thrombocytopenia that are the result of acute blood loss might require a blood transfusion or sometimes several. Without a transfusion, it's possible that your dog will go into shock. If a transfusion is needed, it's usually an urgent decision. Transfusion reactions are always a risk, so dogs need to be monitored closely. The risk of a negative reaction, which could cause shock or even death, is higher in dogs who have received transfusions in the past.